After I came back from one week of holidays I checked the latest papers. Surprisingly, one was by myself! Finally IOP published our work on combined geoscience techniques in the Orkhon Valley, Central Mongolia. We used Georadar, SQUID-gradiometers, capacitive-coupled geoelectrics, octocopter stereoimages, shallow drillings, datings, and archaeological excavations for an geoarchaeological project. Using geophysical, archaeological and geological observations, we assumed a dating in the Turk/Uighur period (6th–9th century AD) and a re-use under Mongolian reign (12th–17th century AD). This would mean that this site is the furthermost walled structure in the peri-urban area of Khar Balgas. The Bundesministerium für Bildung und Forschung (BMBF) funded this project. 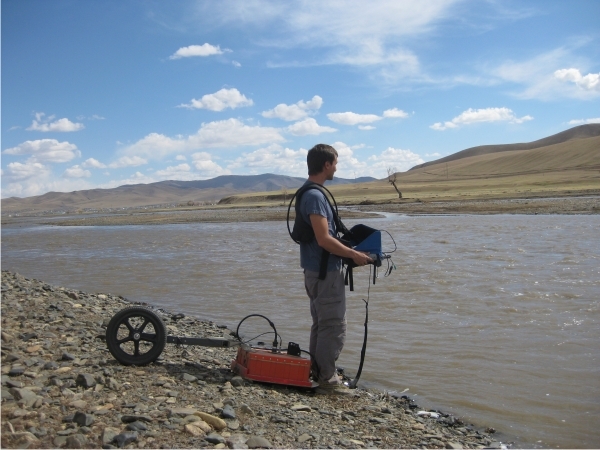 Field work in Mongolia - Ground penetrating radar and OhmMapper measurements in the Middle Orkhon Valley. Grützner, C., Bemmann, J., Berking, J., Frechen, M., Klinger, R., Klitzsch, N., Linzen, S., Mackens, S., Oczipka, M., Piezonka, H., Reichert, S., Schneider, M., Schütt, B., 2012. Improving archaeological site analysis: a rampart in the middle Orkhon Valley investigated with combined geoscience techniques. J. Geophys. Eng., 9, S70-S80. Open access!!! Ground penetrating radar in Mongolia - we not only aimed on archaeological targets but also investigated the sediment architecture of the valley. Some investigations on tectonic geomorphology have been published by Kirby and Whipple in the Journal of Structural Geology: Kirby, E. and Whipple, K. X., 2012: Expression of active tectonics in erosional landscapes. Journal of Structural Geology, http://dx.doi.org/10.1016/j.jsg.2012.07.009. Tertulliani, A., Leschiutta, I., Bordoni, P., and Milana, G., 2012. Damage Distribution in L’Aquila City (Central Italy) during the 6 April 2009 Earthquake. Bulletin of the Seismological Society of America, 102, 4, 1543-1553, doi:10.1785/0120110205. Guidoboni, E., Comastri, A., Mariotti, D., Ciuccarelli, C., and Bianchi, M.G., 2012. Ancient and Medieval Earthquakes in the Area of L’Aquila (Northwestern Abruzzo, Central Italy), A.D. 1-1500: A Critical Revision of the Historical and Archaeological Data. Bulletin of the Seismological Society of America, 102, 4, 1600-1617, doi:10.1785/0120110173. Udías, A., Madariaga, R., Buforn, E., Muñoz, D., and Ros, M., 2012. The Large Chilean Historical Earthquakes of 1647, 1657, 1730, and 1751 from Contemporary Documents. Bulletin of the Seismological Society of America, 102, 4, 1639-1653, doi:10.1785/0120110289. Martin, S.S., and Kakar, D.R., 2012. The 19 January 2011 Mw 7.2 Dalbandin Earthquake, Balochistan. Bulletin of the Seismological Society of America, 102, 4, 1810-1819, doi:10.1785/0120110221. James, M.R. and Robson, S., 2012. Straightforward reconstruction of 3D surfaces and topography with a camera: Accuracy and geoscience application. Journal of Geophysical Research, 117, F03017, doi:10.1029/2011JF002289.